about his most interesting adventures. First, he is just back in DFW from Alaska where he drives a truck for big bucks. According to AL, Alaska is a boomstate where they have felt nothing of the contiguous depression we have here. Put that in the plus column. Now it just gets more interesting from here. You see, AL is not in Alaska because it is frozen and not exactly prime-time for driving gravel trucks. So, Part B of AL’s plan is to be (for lack of a better term) a missionary based in Prague, the Czech Republic. The unGodly money he makes (driving 80 hours a week) for Godly pursuits. He will be back in Alaska in mid April, work through the warmer months, and then back to Prague. In case fellow flycasters have not noticed, there’s not much going on in my business (pronounced “bidness”) right now, and AL could probably use a little company on those 80 hour weeks, and he fly fishes but has yet to do so in Alaska! I know, I know; the definition of UN-godly. I would never entertain this thought, but I was watching the Outdoor Channel the other night, and these schmoes were DIY-ing it in Alaska – just pulling off the road, walking in and catching magnificent fish. I saw it with my own two eyes, and if it’s on TV it must be true. Put that in the plus column. My sister who’s connected to a large airline chimed in with her two-cents-worth, and said check on flights. There may be another trend working here – get me out of here. Put that in the plus column … right? Yesterday, in between fifty-plus mile-per-hour sprints around Ray Roberts Lake, Clint Keating, with a gleam in his eye said, “You know where I really want to go?” I had no idea since I hardly know Clint. 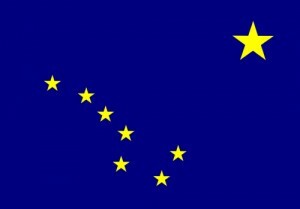 “Alaska.” I should have guessed. Maybe Alaska is a young man’s game, but you’re as young as you feel … right?